During the hotel booking journey, your visitor passes through different touch points on your website and marketing campaigns. She sees your hotel on Expedia but decides to search Google for your website. Your visitor then checks TripAdvisor Reviews, adds them to her Facebook and shares them with a friend. She then asks to be on your mailing list. Without a doubt, this prospect is highly interested and needs further follow-up. Hundreds of hotel booking prospects will visit your site in a typical day. To win them over, they will require a quick and targeted response. 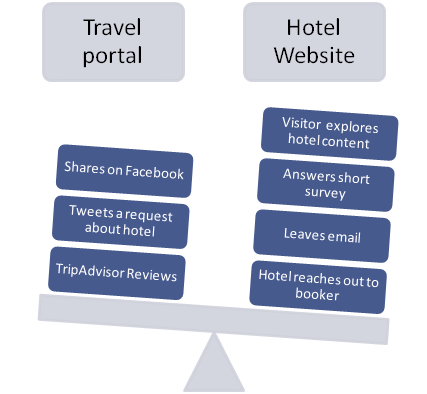 Each of the touch points in the hotel booking journey paint a picture of the prospect’s needs. Your ability to track and monitor these web visitors and interact with them on a personal message can generate very high-quality leads for you. However, it depends on how quickly you can identify the visitors’ behaviors and engage them. Marketing automation services can connect these multiple touch points. As the visitor searches for a hotel booking, you will be able to effectively interact with her. Timing is also key because interactions are important for immediate and long term needs. They also work for new and returning visitors. Leadables Marketing Automation services focus on personalizing the interactions with your visitors. We ensure that your targeted messages reach the right prospects, at the right moment. Not only will your campaigns be more relevant to your visitors, you will also gather better data about their interests and goals making your business more profitable. SIGN UP NOW TO OUR FREE MONTHLY, INFORMATIVE NEWSLETTER AND LEARN HOW TO INCREASE QUALITY BOOKINGS DIRECT TO YOUR HOTEL. There is a considerable difference between the visitor’s Direct Interaction with your hotel website and marketing campaigns and that of the Online Travel Agency. Most importantly, it is your hotel website which has the ability to directly manage the prospect’s hotel booking journey and establish a valuable customer relationship. Instead, the online travel websites, such as Expedia, distribute basic information in the same space about thousands of hotels. And, yes, there are also your competitors. In the online travel agency space, it is difficult to appear unique. More importantly, it is impossible to ‘talk’ to your prospective guest. It is impossible to establish a customer relationship with this person and to identify the customer’s needs and to service them. The bottom line is that without valuable customer relationships, there are fewer Direct Online Bookings and consequently revenues suffer. The ability to increase customer relationships results in an increase in Direct Online Bookings. Hence, this creates a critical competitive advantage for hotels. Successfully explain your hotel’s Value Proposition rather than describe rooms and services in bite-sized, 500-character descriptions called digital-bites. Better understand the buyer’s journey for booking reservations. What is the booking time-frame of your visitor – 30 hours or 30 days? What are her unique needs? Rapidly respond to visitors’ interactions and requests as they lead you through their buying journey. Provide a point-of-reference for retaining customers while containing your costs. Your website should be seen as the customer’s website where she can not only gather further information but also share her travel plans. Provide useful content which relates to your hotel and responds to the needs of the visitor. Take advantage of Scale. As more and more reservations are booked directly through your website, marketing costs per reservation will automatically decrease. The ability to reduce cost per reservation as bookings increase is not possible via the travel portals as each reservation is charged on a standing commission rate. eMarketer, Marketing Automation Roundup, December 2014. Discover more about Leadables and the experience behind our services. Over 30 years experience in digital marketing starting with Videotex. Writes about how businesses and organizations can adapt their marketing strategies and campaigns as technologies evolve. Develops online strategies, content creation and distribution strategies.